For those unfamiliar, a customizable card game is any game in which players "customize" their own set of cards to play with before the game begins, then play the game using their own customized set of cards. Although many collectible games use this customizable mechanism, many customizable games are not collectible - they are merely overlapping terms. 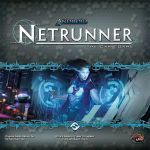 Android: Netrunner is a cyberpunk-themed game for two players, designed by Richard Garfield and Lukas Litzsinger and published by Fantasy Flight Games using their Living Card Game model. Android: Netrunner is an asymmetrical game, meaning that each game involves one player playing as the Runner and the other playing as the Corp. The two sides have no overlap in terms of the cards used. In the game, the Corp must protect Agenda cards and keep the Runner from stealing them. The Corporation wins by scoring 7 points worth of Agenda cards; the Runner wins by stealing 7 points worth. To score an Agenda, the Corporation must put it at risk on the table; to protect that risk, they can play face-down ICE cards to protect it or play a trap card instead of an Agenda. Android: Netrunner's inventive resource system, the inherent bluffing in the form of Corporate face-down cards, and the fact that the resource system causes most games to evolve into interesting board positions makes Android: Netrunner the cream of the crop for me. Magic: the Gathering is a fantasy-themed game for two or more players, designed by Richard Garfield and published by Wizards of the Coast. In Magic, you summon creatures, play enchantments and spells and artifacts, and utilize the help of powerful Planeswalkers to help you in a simple task: reducing the other player's life total to zero. To play these cards, you must fulfill their casting cost by playing and "tapping" land cards (and other mana sources). Magic is high on this list because of the mindboggling variety of play offered by the dozens of formats and tens of thousands of cards available for the game, as well as for the gameplay that's been carefully honed over many years by a strong design and development staff. 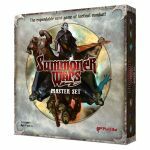 Summoner Wars is a fantasy-themed game for two players (though four can play in a variant), designed by Colby Dauch and published by Plaid Hat Games. In Summoner Wars, you play a summoner who's actually represented on the board by a particularly powerful card. During the game, your goal is to stay alive while making sure the other Summoner does not. You do this by bringing new units onto the board, which you pay for using a particularly clever resource system that utilizes cards you discard and opposing units you defeat. Summoner Wars wins with me because of the wide variety between the sixteen factions in the game - they play quite differently - and the highly inventive resource system that requires you to constantly judge the relative merit of each card in your hand. 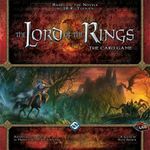 Lord of the Rings: The Card Game is a cooperative game for one to four players set in J.R.R. Tolkien's Middle Earth. It's designed by Nate French and published by Fantasy Flight Games using their LCG model. In Lord of the Rings, you control three heroes who are questing together (each player controls three, so there may be as many as twelve heroes on your collective team). They face a Quest which also has an associated Encounter deck. Each turn, your heroes each generate a resource, which you use to play cards from your hand, but the Encounter deck also generates threats that you need to overcome as you progress on your Quest. This game shines for me because of the wide variety in quests and the strong solo playability. 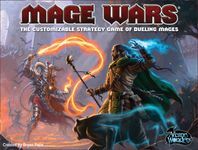 Mage Wars is a fantasy-themed game for two to four players, designed by Bryan and Benjamin Pope and published by Arcane Wonders. In Mage Wars, you are a mage who is engaging in arena combat against one to three other mages. Throughout the game, you summon minions to fight alongside you and cast spells to damage the other mage and his/her minions or improve your own situation. Mage Wars stands out for several reasons. Unlike most customizable card games, you're not limited by the luck of the draw in Mage Wars because your cards are in a physical spellbook (a small card binder), from which you can choose the two cards that are in your hand each round. The customization rules for this spellbook and the freedom it gives to gameplay are incredible. Mage Wars also has the deepest gameplay of any game on this list, as games are deep tactical and strategic battles. World of Warcraft Trading Card Game is a card game for two or more players based on Blizzard Entertainment's World of Warcraft online RPG. It was designed by a large team and published by Upper Deck and, later, Cryptozoic Entertainment. In this game, you play a hero who is dueling against another hero (or more). To aid you in this, you can summon monsters, character improvements, and other items, each with a unique ability. I view the gameplay in WoW:TCG to be the best "evolution" of Magic: the Gathering that I've ever played. The core gameplay is similar to Magic, but many improvements - such as the "quest" cards that replace lands and the variable powers of the hero cards themselves - add a lot to the game. Star Wars: The Card Game is a Star Wars-themed game for two players (though more can play with expansions). It was designed by Eric Lang and is published by Fantasy Flight Games in their Living Card Game format. Star Wars is an asymmetrical game - you're either a Light Side or a Dark Side player, each with their own unique card pool. 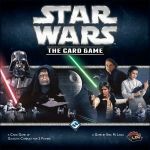 In the game, players fight over objective cards, with the Light Side winning if they destroy three Dark Side objective cards and the Dark Side winning if their Death Star counter reaches twelve - it goes up by one each turn and can be altered by some game effects. Star Wars stands out because of the theme, the interesting deck building mechanism (for each card in your objective deck, you must have five specific matching cards for your player deck), and the asymmetric gameplay. Legend of the Five Rings is a Japanese mythologically-themed game for two players, designed by a small team and published by AEG. Legend of the Five Rings is a storyline-heavy game, where players represent one of nine clans within the game. The gameplay itself is fairly complex, with players having two simultaneous decks during play with different functions, but gameplay generally revolves around the control of particular cards called Provinces, which are generally protected by Personality cards (think "creatures" in the context of other such games). Legend of the Five Rings stands out for its surprising depth, both in gameplay and in terms of its rich storyline. It is a game that would undoubtedly be higher on my list if I had regular access to other players. 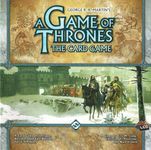 A Game of Thrones: The Card Game is a game for two to four players set within George R.R. Martin's Song of Ice and Fire universe. It was designed by Christian Petersen, Nate French, and Eric Lang and is published by Fantasy Flight Games in their Living Card Game format. In this game, you lead one of the six major houses against other players attempting to win the favor of the Throne, which is measured by Power counters - the first player to fifteen wins. You earn these in a variety of ways, but unlike many other games, you generally don't earn them by simply slaughtering the other guy's creatures - much more subtlety and planning is required. I enjoy the theme of this game - particularly in how it connects to the wonderful novels upon which it is based - and the easy-to-learn-but-hard-to-master gameplay. Warhammer: Invasion is a game for two players set in Games Workshop's Warhammer universe. It was designed by Eric Lang and is published by Fantasy Flight Games in their Living Card Game format. 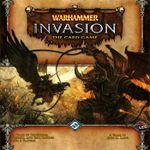 Much like many other customizable games, Warhammer: Invasion involves drawing cards and using resources to play them, with the cards representing monsters, one-off spells, residual effects, and so on. In this game, however, you must protect your Capitol, which is represented by a placard each player has, and the Capitol indicates three different zones into which you can play cards. Depending on where you play them, cards can have different gameplay effects, adding an interesting twist to the game. Warhammer: Invasion sneaks on my list thanks to the two player drafting format, which is unique to this type of game and is my preferred way to play, as it changes the flavor of deckbuilding and results in some very interesting decks.